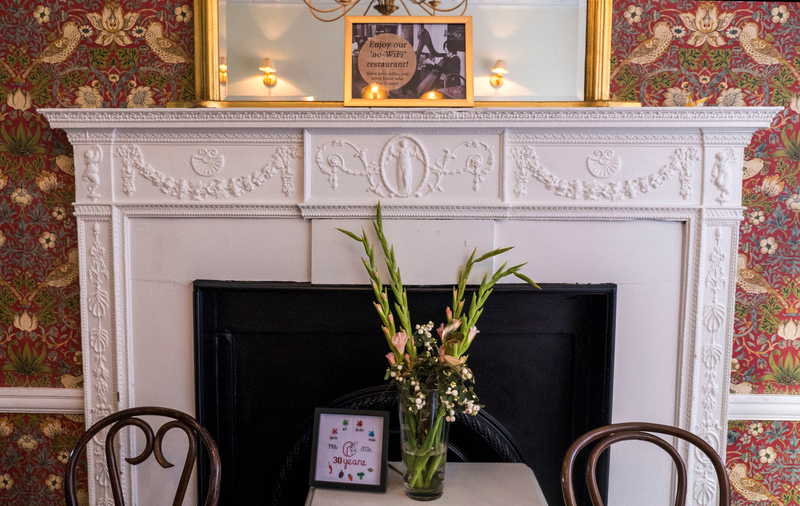 Dublin’s original vegetarian restaurant continues to impress with their wholesome fare. A cornucopia, also known as a horn of plenty, nearly bursts with an abundance of produce and nourishing foods. 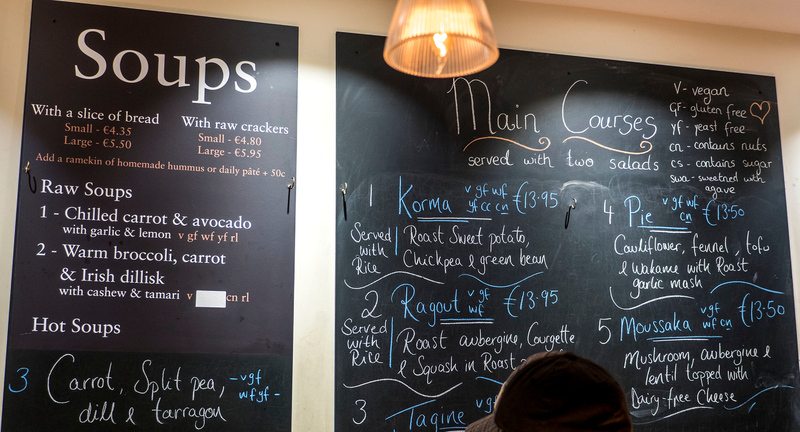 Cornucopia Dublin, the city’s long standing vegetarian restaurant, seemingly overflows with a variety of nutritious and delicious plant-based meals. Since 1986, Cornucopia has served up vegetarian food, catering to vegan, sugar-free, gluten-free, and raw food diets. 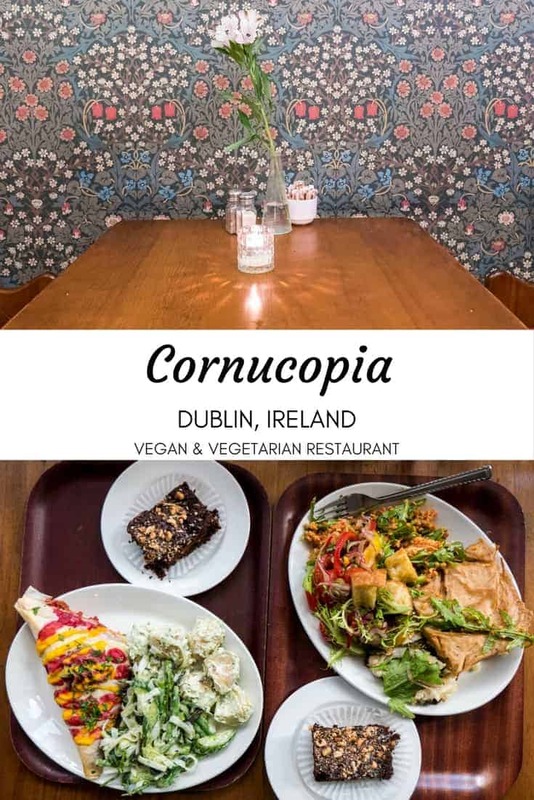 When in Dublin, Cornucopia is a restaurant you should check out if you follow a vegetarian or vegan diet. 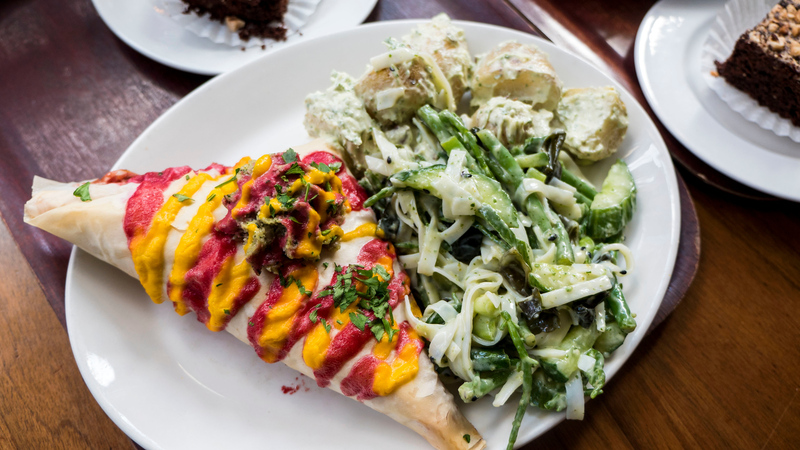 If you want to visit an established Irish restaurant in the city that airs on the side of healthy, Cornucopia Dublin is the place for you. Have you ever dined at Cornucopia? What’s your favourite dish? I managed to visit Cornucopia twice during my trip to Ireland. On the first occasion, I had dinner there, savouring a main course, two salads, and a dessert. On my second time around, it was a stop on my Vegan Dublin Food Tour. 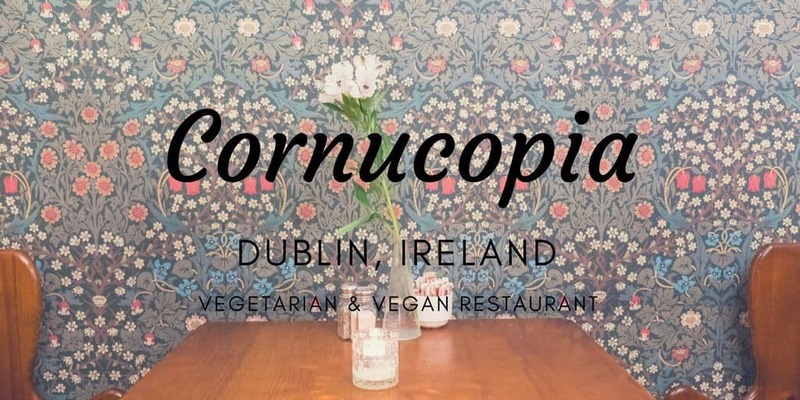 I had no idea I’d be returning to Cornucopia, but it totally made sense to eat at Dublin’s original vegetarian restaurant. 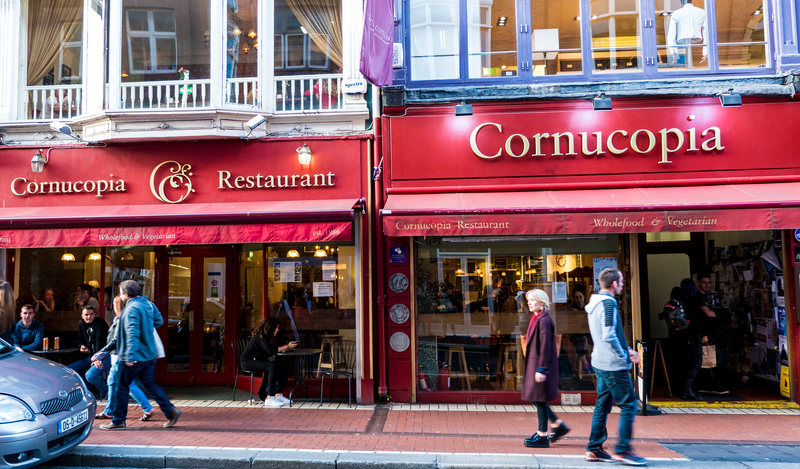 On both occasions, I noticed just how busy Cornucopia Dublin truly was. The place was packed with hungry guests. 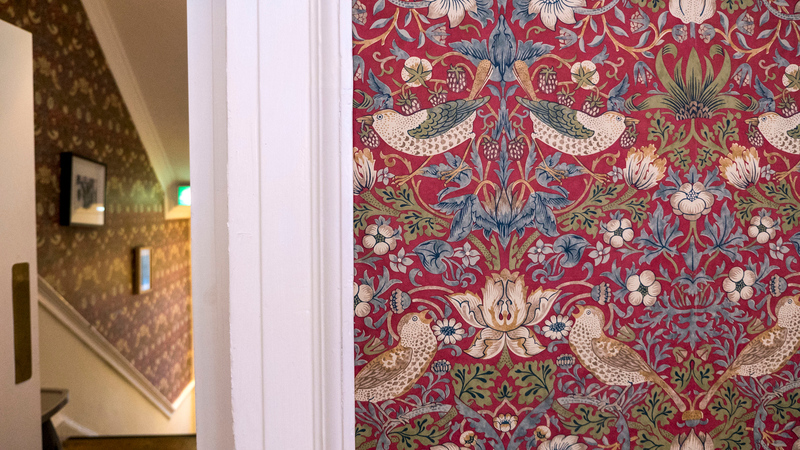 If you’re looking to seek a quieter place, head upstairs. There’s an entirely second seating area on the second floor. If you can snag a spot near the window, you can catch a glimpse of the bustling city street down below. There’s no Wi-Fi at Cornucopia. 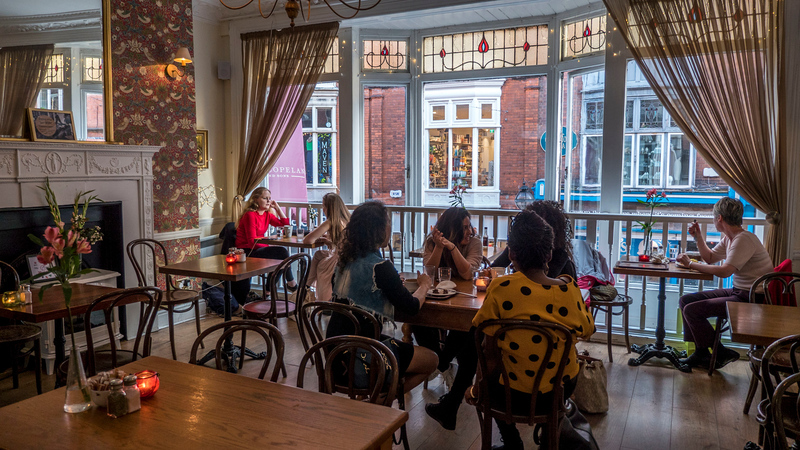 They encourage diners to have conversations with each other without being glued to their electronic devices. 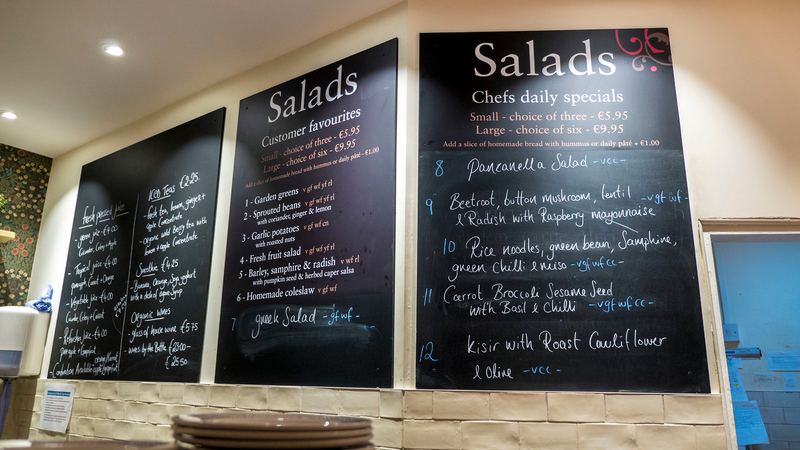 At Cornucopia Dublin, there are way too many delicious menu options. This isn’t a bad thing at all; it’s just hard to decide what to eat! 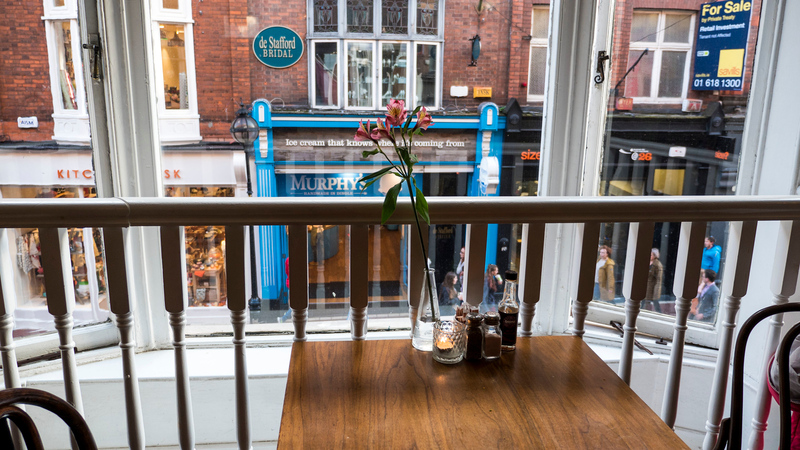 It’s no wonder it’s one of the top vegetarian restaurants in Dublin. Everything is made fresh. There’s an emphasis on local and organic ingredients wherever possible. Every selection tastes like a home cooked meal, prepared with love and care. You can visit for breakfast, lunch, or dinner, with various menu offerings during different times of the day. Vegan items and allergens are clearly marked on the menu board. 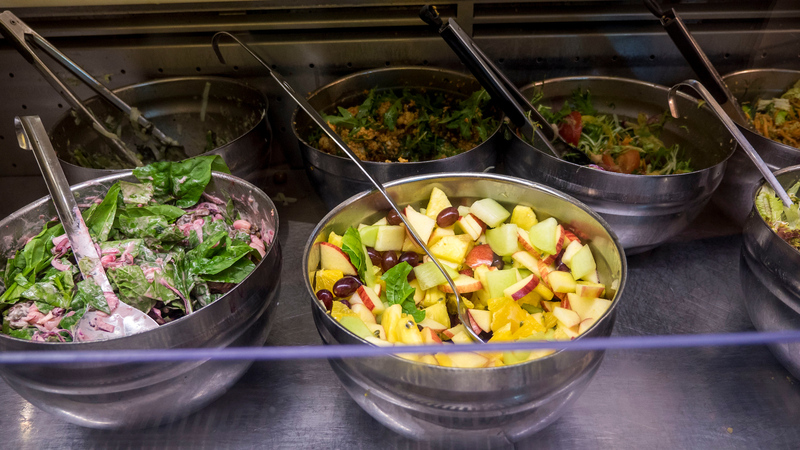 Every day, they serve up two soups, five main courses, ten salads, wraps, and hummus plates. I recommend ordering a main course with two salads. And if you can manage, be sure to choose a dessert, too. For my main course, I enjoyed a pastry pocket filled with a mix of mushrooms, eggplant, chickpeas, beetroot, and peanuts. As for my two salads, I ordered the Asian noodle salad with cucumber and asparagus, as well as the garlic potato salad. Ashley ordered an entirely different main course and salads, which she said was very delicious. 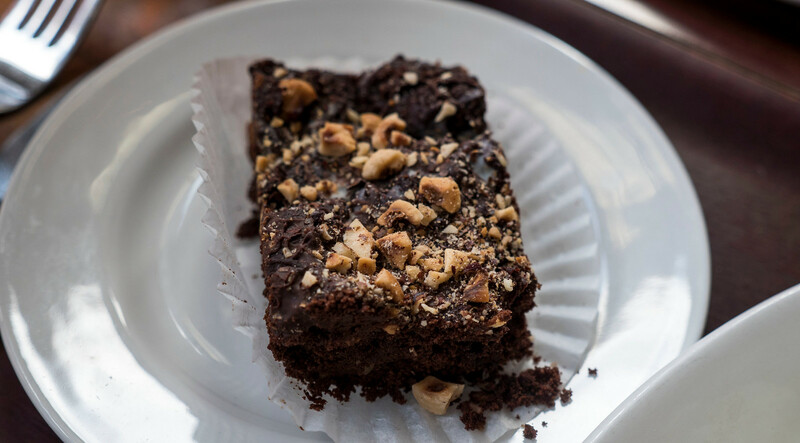 We both indulged in a chocolate brownie for dessert – you can never go wrong by ordering a brownie. Bring on the chocolate…always! If you’re looking for a healthy and flavourful meal, you need to dine at Cornucopia vegetarian restaurant. 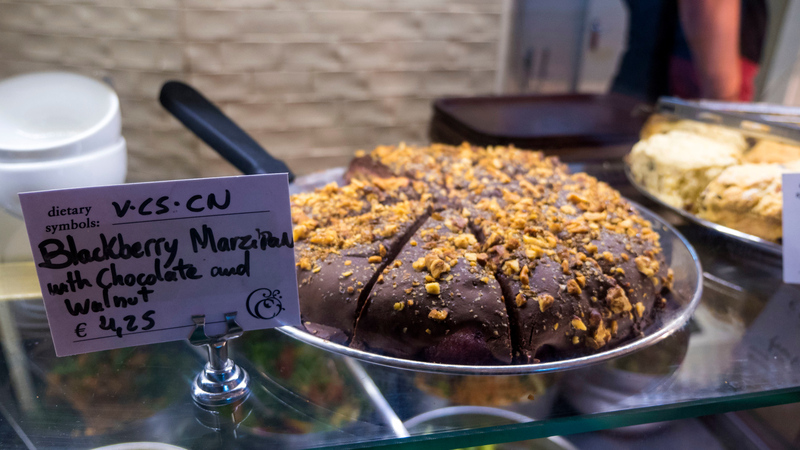 I was delighted when I had the opportunity to dine for a second time at Cornucopia during my Vegan Dublin Food Tour. 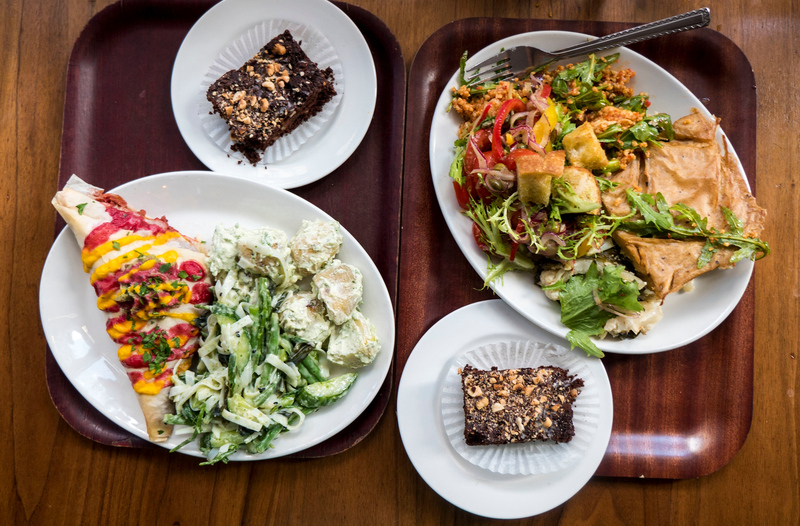 We tried a sampling of six different salads and meals, and they were all so good. I wish I had more time in Dublin to dine there again and again! If you feel inspired by the food you ate at Cornucopia, the restaurant has its own cookbook. Cook your own delicious dishes at home with your own copy of Cornucopia at Home. If you’d like to see more photos from my trip to Dublin, please check out my Dublin travel photography album. I spent two nights in Dublin on two separate occasions, one on each side of an epic three week road trip. 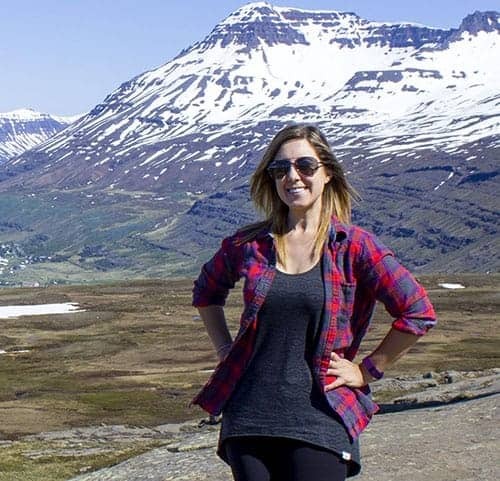 Staying at apartments made Dublin feel like a second home. Here’s a full review of the two Airbnb apartments where I spent the night. Hotels more your style? 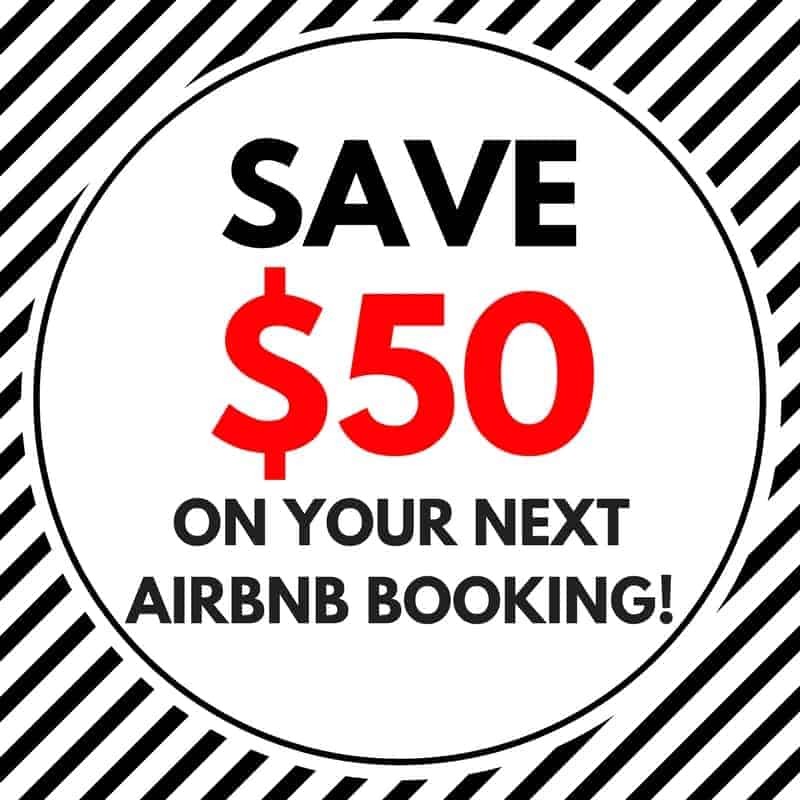 Here are a few places to stay that fit a range of budgets. Luxury: The Merrion Hotel – A luxurious hotel, ranked #1 on Tripadvisor. The Merrion Hotel has every amenity you’d ever want! Middle of the Road: Brooks Hotel – A great location with a mid-range price. You might fall in love! Budget: Roxford Lodge Hotel – This might be a budget hotel, but it’s still comfortable and within walking distance of the downtown core. Wow it’s a amazing post about Vegan & Vegetarian Restaurant. I follow a vegetarian or vegan diet so I would prefer and want to visit an established Irish restaurant in the city.